Homelessness is a sad reality for far too many people - and not knowing when you're next going to eat a hot meal is something nobody deserves. The scary truth is that a series of unfortunate circumstances could leave lots of people in that situation. 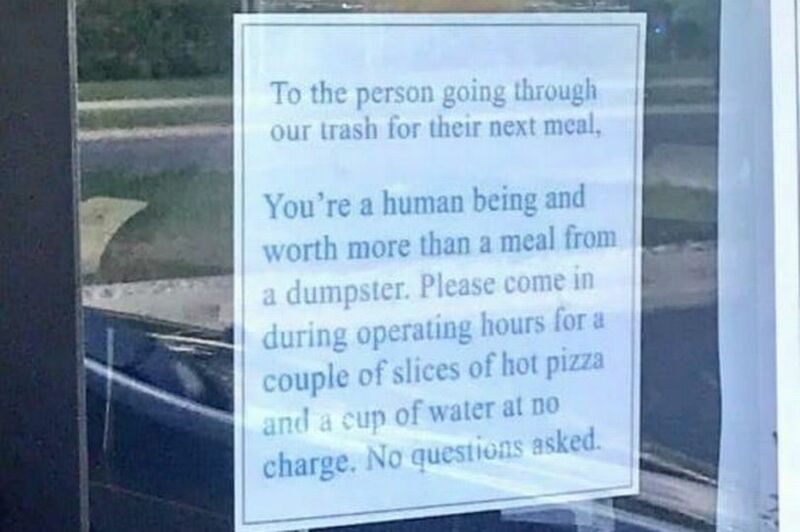 One pizza restaurant in North Dakota spotted a homeless person eating out of their bins and sent them an amazing message. Little Caesars wrote on a note that was posted on Facebook : "To the person going through our trash for their next meal, you’re a human being and worth more than a meal from a dumpster. "Please come in during operating hours for a couple slices of hot pizza and a cup of water at no charge. No questions asked." Manager of the shop Michelle Lussier had noticed people eating from the bins and put up the sign offering free pizza - which is incredible. "You feel down about that, you’re more than welcome to come here and grab a couple slices." She also said that the restaurant donates leftover pizza to the local food pantry and even has a donation box inside the store that gives to homeless people in the area. Having to take food from bins or even steal it is sometimes necessary for homeless people to survive. What happened to the trend of "Paying ahead, to buy a meal for the needy?"